The Brics group of emerging economies on Tuesday launched its New Development Bank (NDB) in Shanghai. The bank is backed by Brazil, Russia, India, China and South Africa - collectively known as Brics countries. The NDB will lend money to developing countries to help finance infrastructure projects. The bank is seen as an alternative to the World Bank and the International Monetary Fund, although the group says it is not a rival. The Brics nations have criticised the World Bank and the IMF for not giving developing nations enough voting rights. The banks is expected to issue its first loans early next year. 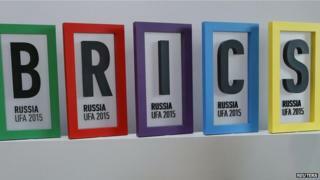 The opening comes two weeks after the last Brics summit in the Russian city Ufa, where the final details were discussed. At the time, Russian Foreign Minister Sergei Lavrov said that the five countries "illustrate a new polycentric system of international relations". The bank is to start out with a capital of $50bn (£32bn) though the amount is to be doubled in the coming years. The biggest contributor will be the world's second largest economy China, which also led the establishment of another new international bank, the Beijing-based Asian Infrastructure Development Bank. The NDB is to be headed by a rotating leadership with the first president, Mr Kamath, coming from India. It was first proposed in 2012 but protracted negotiations over headquarters, management and funding have long delayed the actual launch.